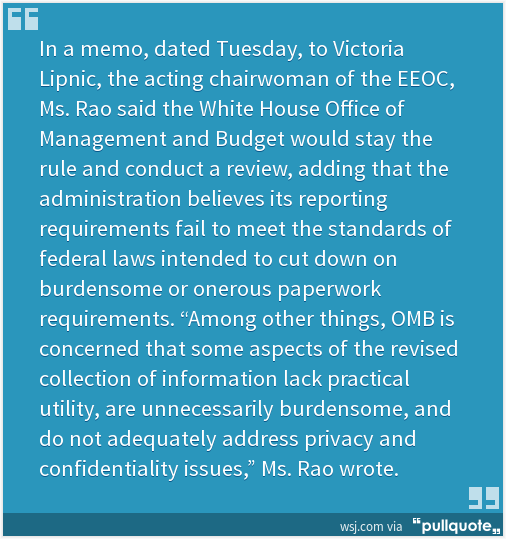 Yesterday, both Jacqueline Thomsen at The Hill (here) and Ted Mann at The Wall Street Journal (here) that the proposed EEO-1, which would have made your head spin with all the additional information to be collected, is now on ice. The White House put the kibosh on it on Tuesday, and the EEOC confirmed that employers will be spared the increased filing burden for the foreseeable future. You know the expression, “Don’t shoot the messenger.” Well, this is just the opposite. You know what to do. Now, to be clear, qualifying employers still have to file the existing EEO-1. Honestly, I’m not sure how this news impacts the hyperlink in the previously paragraph. Maybe, don’t overthink it is the right approach.